Not sure who I am trying to parody with the title but long before the Mexicans were being told that they had to build and pay for a wall to stop them getting into another country the Romans constructed a wall to stop the English and the Scots mixing. 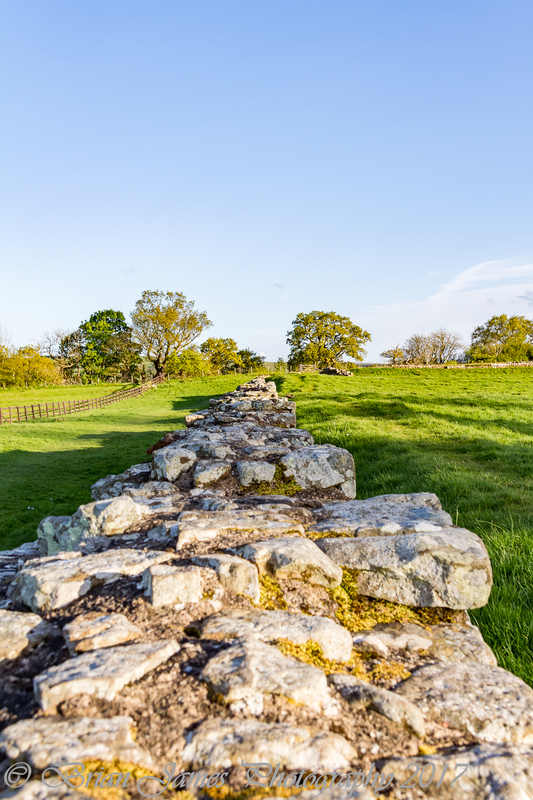 Way back in AD122 the Emperor Hadrian had a 73 mile wall named in his honour which stretched from just west of the village of Bowness-on-Solway all the way East to the Roman settlement of Segedunum, or the town now referred to as Wallsend on the banks of the River Tyne. From a photographers point of view it makes an excellent subject matter. The limestone, weathered over almost two thousand years creates intricate patterns and fascinating shadows. I decided to take a short drive from my home in Brampton to the Roman fort of Banna, now the site for the former farm of Birdoswald in the parish of Waterhead. 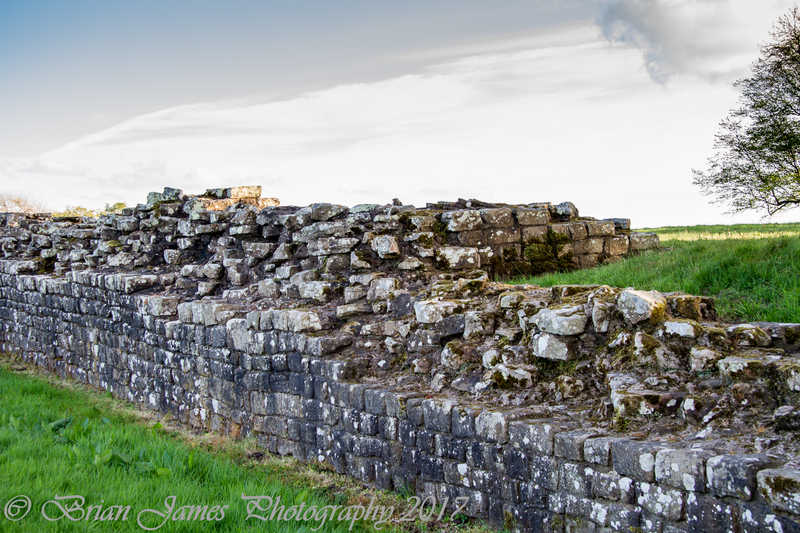 Hadrian’s Wall has always had a tie into my own personal history. I was (except for one week) born and bred in Wallsend and for the past thirty years lived across at the opposite end of the wall. In fact, when I was a child I vividly remember a pair of lines some eight teet apart made from cobble stones set into the road away from both my front door and my back door. These showed the original path of the wall. So Yes, I actually lived ‘on’ the wall as a child. I still marvel that something man made from comparatively basic tools can still be so well preserved, especially in the harsh weather of Northern England. 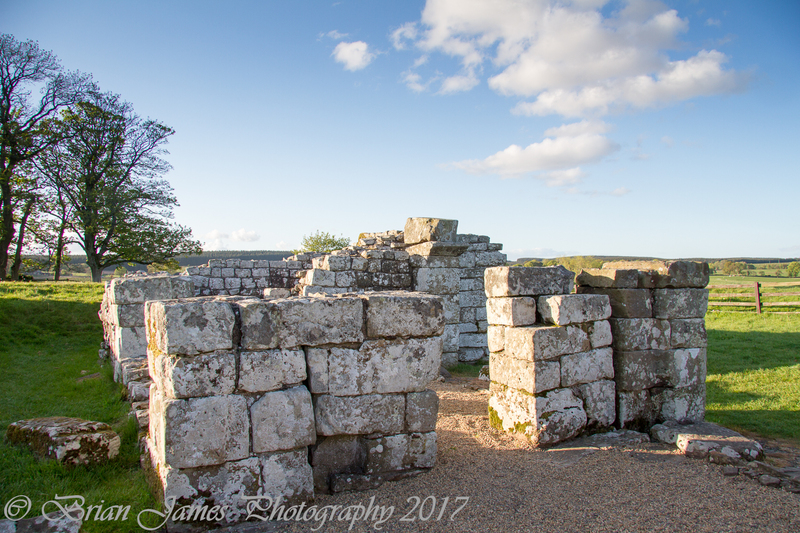 I arrived at Birdoswald in the late evening during the ‘golden hour’. As I said in my last blog posts, I love this time of day, the only drawback being long low shadows which can cause some real problems for a photographer. The light makes the colours of the grass and the highlights in the limestone of the wall ‘pop’ which makes the place welcoming. Where the wall does exist it is tracked, often very closely, by local roads which gives the public excellent access to get up close and personal to this world monument. It is amazingly straight, disappearing into the distance until the line is broken either by newer buildings on top of its path or by its historic dismantling by local farmers to provide stone for their own buildings over the decades. The area on the Cumbria, Northumbria border is where the best sight are, where the most complete sections remain. It is a treasure for recreational walkers and cyclists who visit in their thousands each year. Luckily, my timing was excellent as there was almost no one there, just a conservationist at the Birdoswald fort making repairs to the wall using traditional lime mortar to keep the walls integrity for generations to come. It is a situation which is known well to any modern military man who is posted to the likes of Afghanistan or Iraq today. The barren, bleakness of the countryside surrounding the wall adds to the visual contrast. There are still many people farming the area. Hardy folk who rear sheep and cattle. Even though there are good modern roads and cars which make the local shops only a short drive away the area is still a foreboding place to live. Snow drifts of well over six feet are more than common up here and even a Land Rove will fail to get through. Capturing this bleakness on film is difficult as most of the atmosphere is ‘felt’ rather than observed. In fact, because of it’s vastness it is difficult to gain an idea of perspective. Its only when you realise that the wall at this point is some six feet wide that you realise just how far away the distance point is. As always, time is never on a photographers side and so it was time to turn to the West and head off home again. 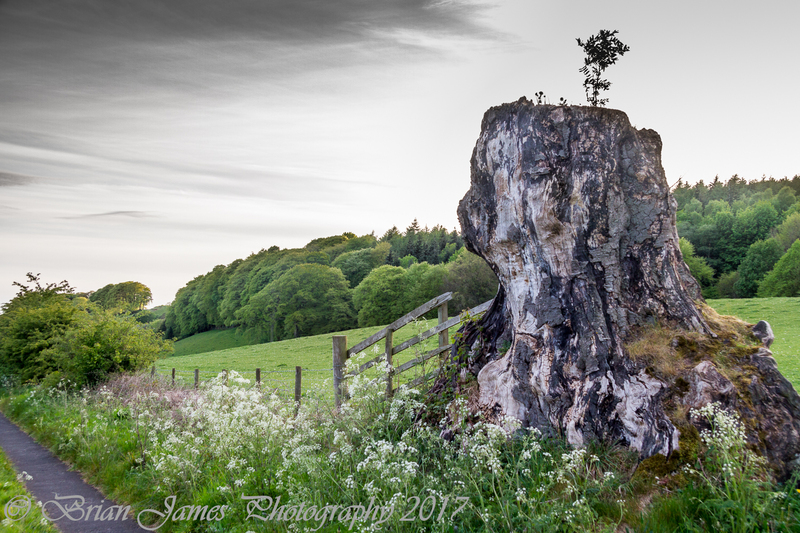 Driving along my attention was drawn to this tree stump standing guard to the entrance gate of a field. It just seemed to shout for me to stop and look around . I was captivated by the small bush growing out of the stumps truncated top. It was almost standing as a defiant gesture, almost saying “see, I’m not dead yet” as new life develops from the old. The knarled bark gave a suggestion to its age and history which intrigued me. I just had to take a closer look so I jumped over the gate (that makes me sound so athletic….I wish) and looked from the other side. It was almost shocking at first to see the rotten bulk on this side contrasted with the strong image presented on the other. But once again that small shoot towered defiantly on the top. Where I said the stump had seemed to shout for me to stop and look. I realised that its magic had worked again. 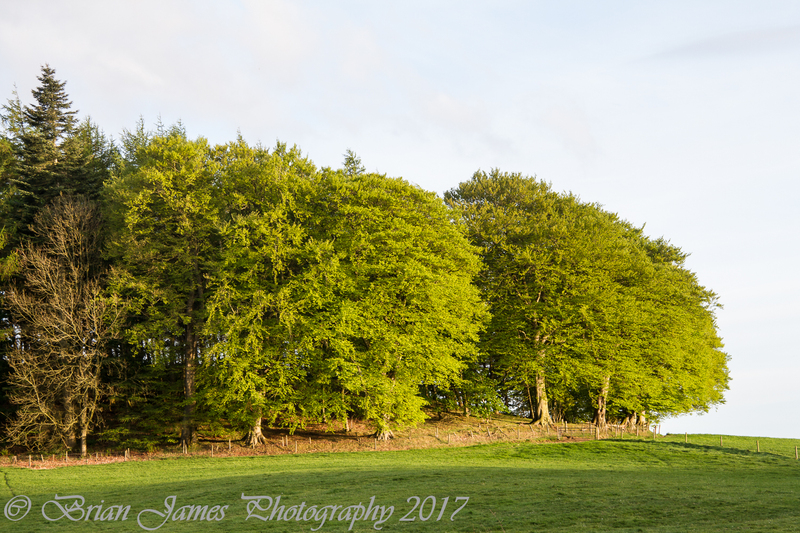 Looking beyond the stump I saw a beautiful avenue of magnificent green trees positively shining in the evening sun. I just had to get a better look, so climbing the fence again and crossing the road gave me my favourite view of the evening. The green foliage had a warm yellow orange highlight to it and as I looked the whole place seemed to fall silent and peaceful. We often forget to look for the beauty in the items on our doorstep. These trees are only one and a half miles from my own front door and I must have passed them a thousand times. But for some reason, today they spoke to me, and I listened. To conclude the story of the wall. After Hadrian’s death in AD133 his successor Antonious Pius effectively abandoned the wall. It stayed as a support role and as a trading post. 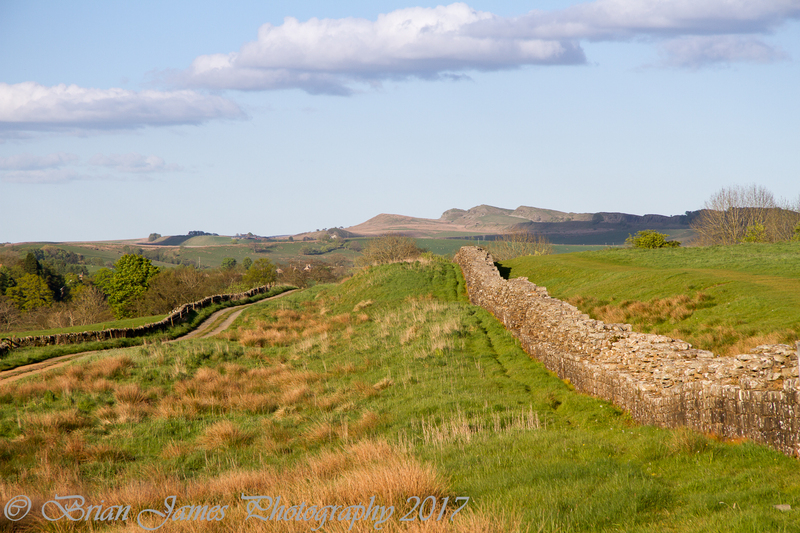 He started building a wall in his own name some one hundred miles to the north in the Scottish lowlands in AD144, the Antonine wall. However in AD164 the new Emperor, Marcus Aurelius realised that he was unable to conquer the Northern tribes and pulled back to Hadrian’s original wall for his Northern defences. 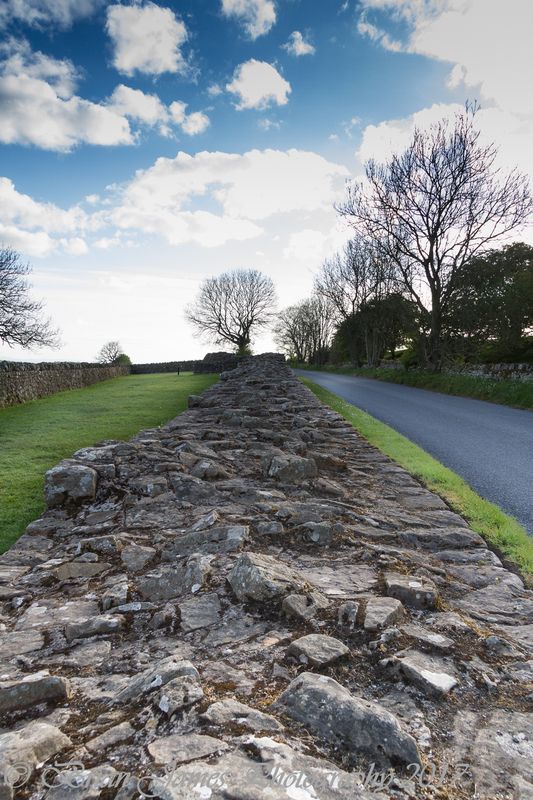 By AD410 the Romans had abandoned the outpost of Britain and the wall started its slow demise. But, that’s another story. Till the next time…keep shooting.